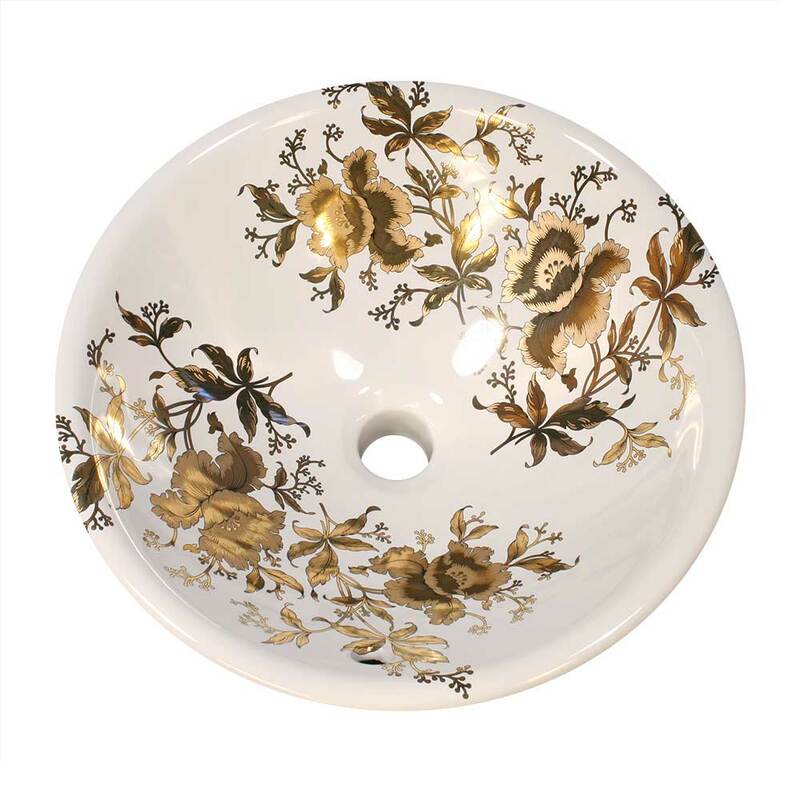 This is a custom version of our popular Gold Orchids painted sink design, this time on a 16″ round porcelain vessel sink. I normally do it on a fluted drop in but this customer wanted a vessel for her beautiful turquoise powder room, to be discussed later in the post. The sink is a great basin for an elegant powder room. It’s painted with matte & metallic gold orchids, leaves and stems, outlined and highlighted with black. It’s brings a lot of bling to your bathroom, powder room or guest bath. Gold also goes with anything. The design is also available in platinum on our website here, Platinum Orchids Painted Sink. Front view of the sink showing the orchids. As you can see in this photo, the porcelain vessel sink is decorated with the orchids on the inside and outside of the bowl. They are kiln-fired to approximately 1500 degrees which permanently fuses the flowers to the glaze on the sink. It won’t wear out or fade away with proper care, which is nothing abrasive, clean with mild detergent and buff dry with a soft cotton cloth. That’s it. This is a customer photo of their guest bathroom. 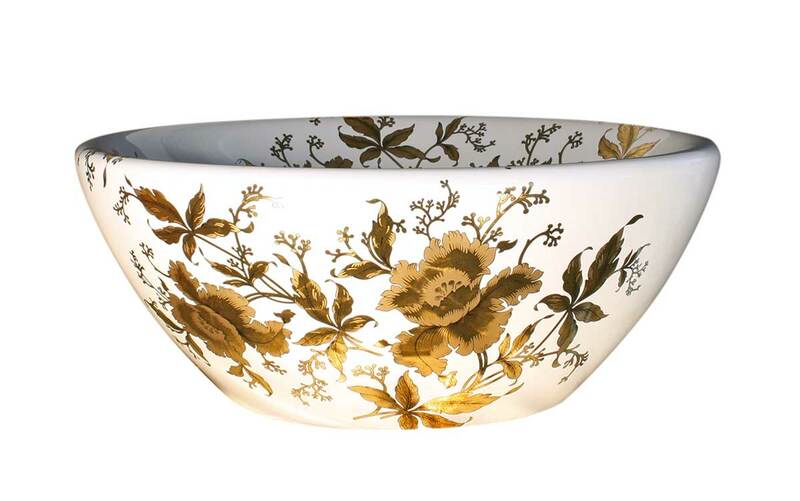 It’s a custom version of the Gold Orchids design, this time on a round white vessel sink, approximately 16″ in diameter. The photo is a little low resolution, but you get the picture, LOL. She completed the look with large white subway tiles with gold inset tiles, a nice ornate gold mirror and a really stylish gold faucet. All looks great, especially with the turquoise wall. One of the smart things this customer did is that she can totally change the look of this bathroom by just changing the wall color or adding wallpaper. This is the actual soap dispenser and tissue box cover in the bathroom shot. I took a photo this time! I did take a photo of these two items. 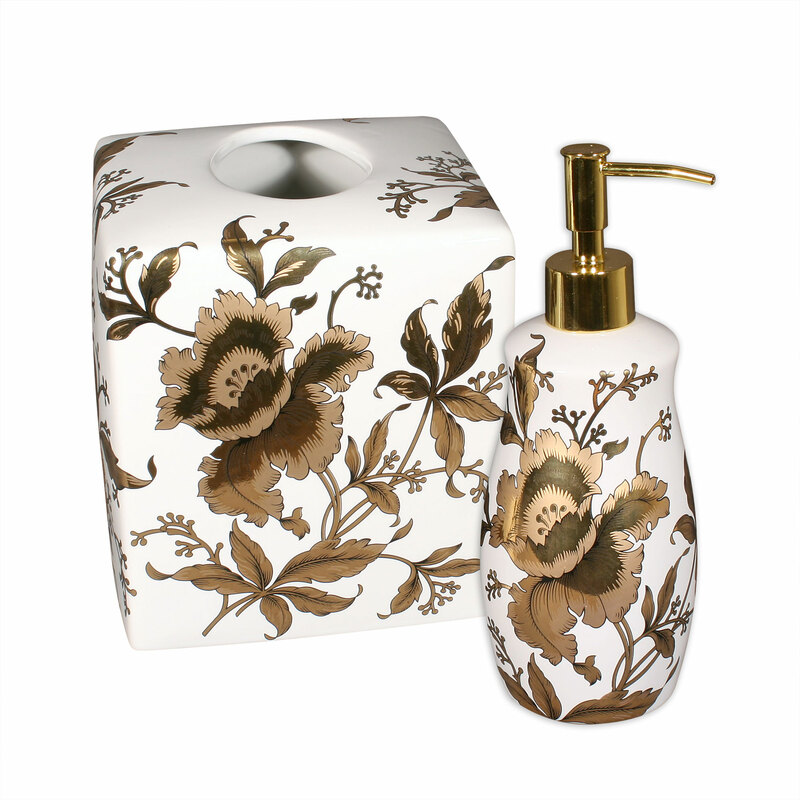 A ceramic tissue box cover and tall soap dispenser decorated with a matching Gold Orchid design. They complete the look of the decorated bathroom, and tie all the items together. You can tell I’m getting tired of writing this blog copy, I’m getting desperate!!! The customer loved this sink so much she ordered two more in a different design for the master bathroom. 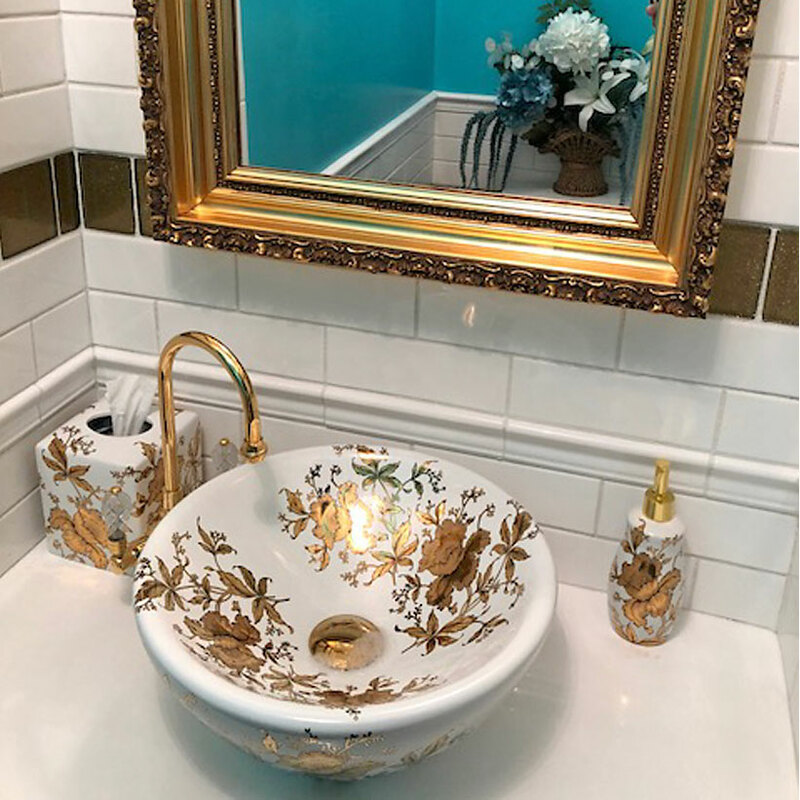 You can see some of the other Gold Orchids decorated bathroom fixture we create in a previous blog post, Gold Orchids in the Powder Room. This is one of our most popular painted sink designs on the website decoratedbathroom.com. Here you can find a complete collection to suit every taste of decorated bathroom fixtures, sinks, toilets, tiles and accessories, all made by me, Lynne. Thanks for reading.